Block 2 gave me a bit of trouble. This is the first attempt and I measure way too big. Over a 1/2" too big! I messed and messed with it and couldn't get it right, so I too off the last round and started over from the white square. 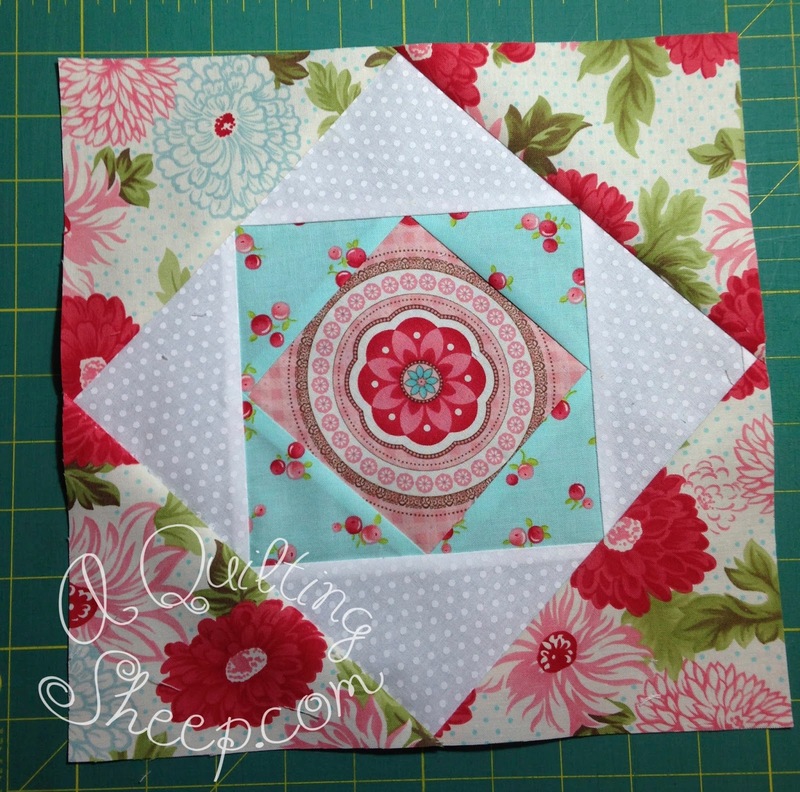 Instructions for this block can be found at Donna's Lavender Nest. Amy, what pretty colors you selected! I love the block. Very nice. I love your block Amy. The fabrics are great. I am so sorry you had so much trouble. I am not doing this sew along but you are the second person to have this problem! Just an FYI, maybe it is the directions and not you! Oh Amy, Love the colors. Maybe you could email and ask if others are indeed also having the trouble. If it were me,I would leave it. I loose point all the time!! You re making me nervous! I finished the first one and this is a little more difficult for me...not very good with points!! Love your fabric choices! I finally have my coordinating solids so I hope to make my blocks this weekend. I love your fabric placement! 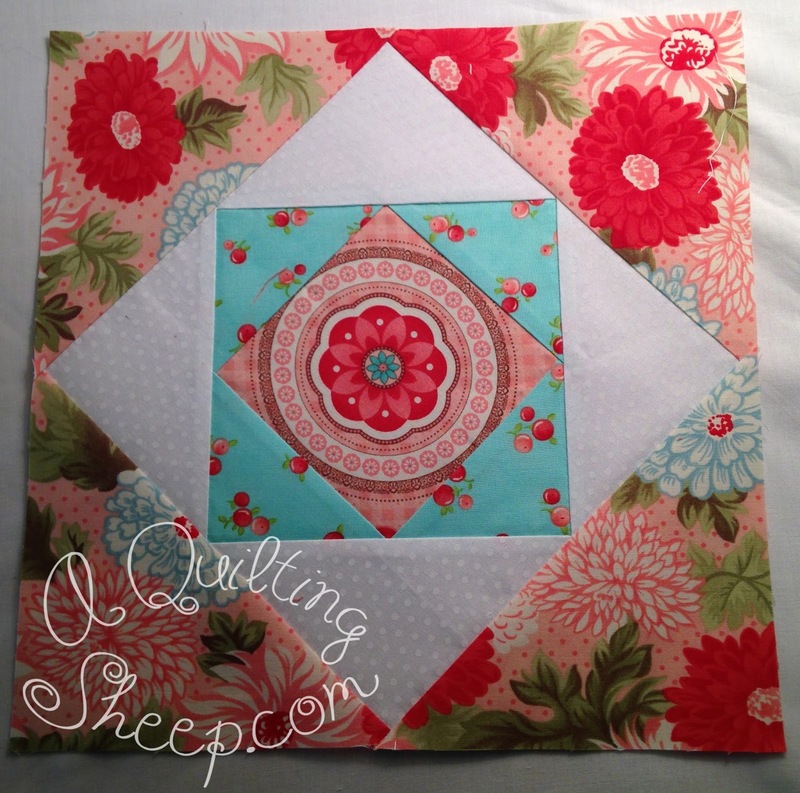 That first square looks like a medallion-it's perfect! I worry about my points too; my seams don't match up in the best of circumstances. However I'm doing this sampler for fun & to stretch me so I'll do my best and see how it turns out. :) Yours is going to be great! I had that problem with a Farmer's wife block yesterday. I kept fiddling with it. After a while though I know it is time to just leave it alone and do something else. Gorgeous fabrics as usual though. Oh, oh! This must be a tough block! I am waiting for my fabric and should start mine this week!! I hope I can figure it out! Yours looks so pretty as everything you make always looks so darn pretty! very pretty blocks. love the centers.